Lindsay is an Audit Manager at Bauknight, Pietras & Stormer, a local accounting firm in Columbia. She is a licensed Certified Public Accountant. Lindsay works on a variety of audit and financial reporting engagements for companies primarily in the telecommunications, manufacturing, captive insurance and distribution industries. In addition to providing traditional accounting and auditing services, Lindsay has worked on acquisition related due diligence engagements, agreed up procedures engagements, cost allocation models and other special projects. 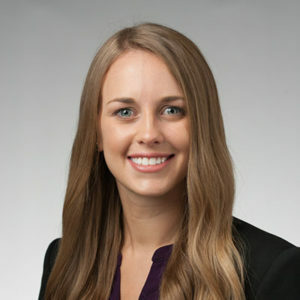 Lindsay graduated from the University of South Carolina with her Bachelor of Science in Business Administration in 2011 and her Masters of Accountancy in 2012. Lindsay taught Accounting 225, Introduction to Financial Accounting, as part of her fellowship during the graduate program at the University of South Carolina. In addition, Lindsay has presented at numerous accounting and auditing educational seminars. Lindsay is active in various organizations across the community including Columbia Opportunity Resource and the Contemporaries of the Columbia Museum of Art. She also graduated from the South Carolina Association of CPA’s Leadership Institute in 2015 and the Leadership Columbia class of 2017. As a Columbia, SC native, Lindsay has had the opportunity to see the city grow and transform over the years. Lindsay joined COR because she is passionate about Columbia and making it a great place to live. In her free time, she enjoys yoga, spending time with her two dogs, and checking out local restaurants, breweries and festivals in downtown Columbia.